Merlin Cottage01263 715779work01603 870304fax Self-cateringThis terraced flint cottage sits in the wonderful town of Southrepps. Having been lovingly refurbished and maintained to a high standard, this property features comfortable furniture and modern utilities. There are a selection of quiet paths and cycle routes to explore. The nearby pub serves food and the beach is only three miles away. Front view of Merlin Cottage. 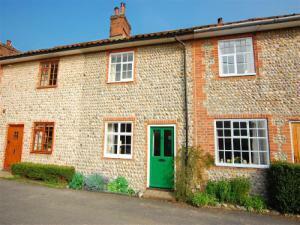 This terraced flint cottage sits in the wonderful town of Southrepps. Having been lovingly refurbished and maintained to a high standard, this property features comfortable furniture and modern utilities. There are a selection of quiet paths and cycle routes to explore. The nearby pub serves food and the beach is only three miles away.